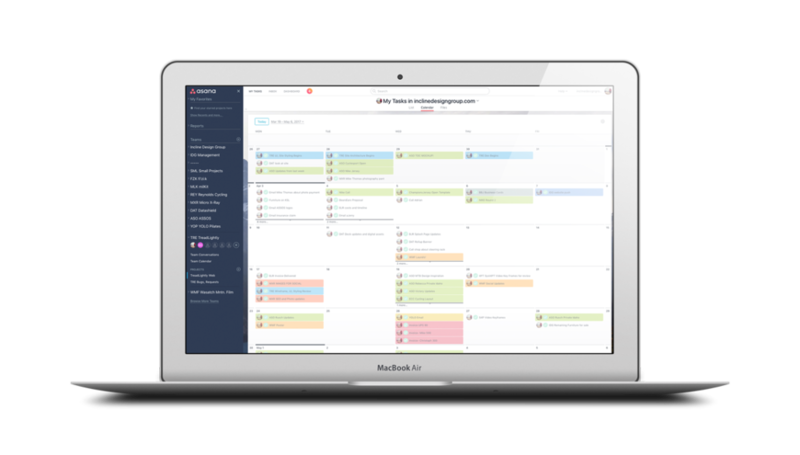 I have used several project management software platforms over the years, including Basecamp, Trello, and Jira, and Asana is by far my favorite. The software platform is so simple and straightforward that when I show clients or new contractors how it works, all I really need to say is: Just think about the simplest way to accomplish whatever it is you’re trying to do, and that is probably exactly how it works. Being a visual person, the Calendar view is my favorite aspect of this platform. You can see an overview of all the tasks assigned to you, or you can dive into Teams or Projects to see the full details for individual projects by week. Need to change the due date of one of your tasks? All you need to do is drag it to the correct date. So easy. Asana also has an iOS app (and and Android app) that I use at night before going to sleep to prioritize my work for the next day and week, but I have to say, it still needs a little work from a UI perspective (it takes 4 clicks to create a task, which is definitely too many). I want the iOS app to be as straightforward as the browser-based app where I can just click a date, assign it to someone (or myself), and then write the description and be done. People who love Evernote, love Evernote. There is a free version of this note-taking software, but free users really miss out on the key features that make it so ubiquitous in our workflow. The ability to jot down notes wherever you are, shoot emails straight into projects, and save inspiration and ideas into separate notebooks is very slick. For our distributed workforce we have set up a folder that everyone in our network has access to. This includes meeting notes, client content, etc. Have a meeting with a client, update feedback on a site in the notes, and everyone on the project sees those notes as soon as the meeting is over. The search functionality in Evernote is very snappy and pulls results from Note Titles, Note Content, and hosted documents too. This is also available for iOS, Android, Desktop, and via a browser-based app. Having all of your notes accessible wherever you go is incredible. We all know that some of our best brain storming comes when we’re not thinking about work . . . and being able to pull out my phone on a run, a hike, or at dinner and quickly jot down some thoughts is mentally liberating. One last great feature that really became apparent (and where I started using Evernote extensively) came to my attention several years ago at SXSW—being able to post links to notes publicly on services like Twitter, or share complete notebooks with the world at large, is very slick. And being able to flip through other people’s notes after brain-melting discussions at SXSWInteractive to see what you missed, or glean extra insight into the talk after you get home, is a level of information sharing I don’t think we’ve really seen with any other service out there. These notes (link here) from SXSW 2017 are a great example of that! Of course, this is a given. There is a plethora of other cloud-based drives on the market now (including G-Drive, Box, iCloud Drive, etc. etc. ), but Dropbox has been the best I’ve used, hands down. All of our work files live permanently in Dropbox. With a folder on your desktop that automatically syncs to the cloud, you have the convenience of working from locally hosted files, but as soon as you save and update them, they are available on all of your devices. In our small-agency model, we have folders set up for internal/management-shared files and billing, and we have folders set up and shared with our contractors on a project-by-project basis (which gives everyone instant access to the latest versions of working files, docs, and briefs), and then we have a separate set of folders that we share externally with clients. We have also set up a physical drive that also syncs to Dropbox so we are always sure we have a backup copy (beyond the half dozen or so computers that Dropbox is regularly syncing between). With the Selective Sync feature in Dropbox’s desktop settings, we are also able to sync just specific client and management files to the laptops that we have with us out in the world—especially useful when there isn’t room for the full 10TB of data on our small solid-state traveling drives. Setting up a time to hop on the phone and talk business with your Swiss or Italian clients is tricky—they’re eating lunch about the time you wake up, and your post-lunch meeting blocks fall right when they’re sitting down to eat dinner. UbercConference at least alleviates some of the technical speed bumps in scheduling and getting on the phone. UberConference is a new platform for us in the last year, but it has immediately become indispensable. Not unlike the simplicity and cleanliness of the Asana User Interface, UberConference does exactly what you want it to and very simply. This is a conference calling SAAS platform that allows you (with a paid subscription) to set your own PINs, record your calls for transcription, and even set your own personal hold music. Clients and contractors are able to call in from anywhere in the world and you are able to cleanly see in the web interface who is on the call, who is talking, and even how much time each person spent with the conch in each meeting (I’m always surprised by how much I talk—I think I’m generally a pretty quiet person…?). UberConference also gives you the ability to connect to the call via either your computer or their iOS app, or with a call-in number on your phone. The meeting notes sync straight to Evernote when the call is completed, and the rich user information (such as LinkedIn profiles) makes getting to know the people on the call with you even easier. We have used a lot of different conference calling and VoIP services over the past 15 or so years, and this is by far the easiest and most reliable we have used. Even the free version is worth using if you’re hesitant to throw them a few bucks a month for their great service. Whether you are a freelancer, an agency, or an independent contractor, we highly recommend Harvest. I was a little hesitant to give them my credit card info when I first started using it because I wasn’t sure I couldn’t just as easily use a spreadsheet to track my hours on a project. But let’s just say within about 2 weeks I was completely sold. Harvest is a time tracking and project billing platform/SAAS that, like the other services in this list, cuts out the crap and gives you a very clean and quick interface. With the Menu Bar widget on MacOS, it is so easy to start timing when you’re working (and commenting for project specifics, like Change Orders, or who authorized the work you’re doing), that it is just a part of hopping into Illustrator or Photoshop now. With robust and easily filtered reports, project- and client-based reporting, and even the ability to send invoices straight through the platform, Harvest has proven itself to be indispensable for our business. On larger projects we will set up contractors with Harvest accounts so they can record hours directly to the project. It is easy for us to keep an eye on expenses and mind the project budget, and our Project Managers can make sure that there is forward momentum on a week-by-week basis. Are these all the tools that we use on a weekly basis? Not by a long shot … but these are definitely the 5 we spend the most time with. Every one of these 5 platforms makes our work lives easier, helps us manage our distributed workload, and makes it easier for us to spend less time sitting at a desk and more time out and about while still getting our work done. And who doesn’t want that!? There are some other notable services that we use and love that we just have to mention here … Like Google Docs, Sheets, Calendar (You know. You use it. You love it.) The ability to create spreadsheets that are filterable and sortable and shareable across the web is particularly indispensable. Stay tuned for an upcoming post on those. And that’s about it… these 5 pieces of software make our lives so much easier and make running a business with a distributed work force a much less daunting task.